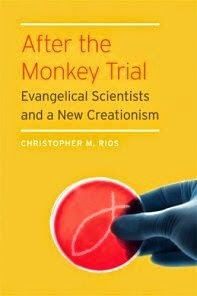 I recently received a copy of Christopher Rios’s After the Monkey Trial: Evangelical Scientists and a New Creationism (Fordham University Press, 2014), and posed a few questions to the author. Dr. Rios teaches at Baylor University, and also works as the Assistant Dean for Graduate Studies. Phillip Luke Sinitiere (PLS): What is the main argument in After the Monkey Trial, what central points do you make about modern evangelicalism and scientific thought? Christopher Rios (CR): My main argument, simply put, is that the most prominent evangelical scientists of the twentieth century actively resisted the antievolutionary movement that developed after World War II. That is, between the 1950s and the 1980s, when “creationism” came to dominate American evangelicalism and gained considerable international support, a noteworthy group of evangelical scientists in both the US and UK sought to demonstrate that Christianity and science, or more properly theology and science, were not mutually exclusive categories that required acceptance of one only by rejection of the other but were complementary ways of viewing the world. My book thus furthers our understanding of how modern evangelicalism was never monolithic in its view of science. Even when considering the mid twentieth century, the attempt to define evangelicals or evangelical faith according to a particular view of science is misguided. Clearly, no small number of evangelicals, especially fundamentalist evangelicals, rejected evolution. Many did so for theological reasons, others on scientific grounds. A few even claimed to demonstrate scientific evidence against it. But as demonstrated by the groups that I wrote about, the American Scientific Affiliation and the Research Scientists’ Christian Fellowship, other evangelicals accepted and even advanced modern science, including evolution. PLS: The birth of the American Scientific Affiliation (ASA), and a splinter group, the Creation Research Society (CRS) in the US, was contemporaneous to the birth of the Research Scientists’ Christian Fellowship (RSCF) in the UK. This seems to add a crucial transatlantic component to the story. Yet it also occurred around the same time that modern evangelicalism was undergoing tremendous intellectual evolution, in essence what historian Molly Worthen has recently termed a “crisis of authority” about the Bible, history, and modern life. Can you talk about the intellectual currents of the mid-twentieth century that influenced these scientific groups, all of which in one way or another attempted to live their faith in relationship to modern intellectual life? CR: Yes. The transatlantic bit of this story is important, in part because of how it demonstrates the influence one side had on the other, in part because of the way similar events on both sides occurred without awareness of the other. This last point is best explained by common cultural forces at work in both parts of the world. Let me mention three. First was the culmination of the professionalization of science. The development of modern science, of course, occurred over centuries. But there was an acceleration of its professionalization from about the mid nineteenth century to the mid twentieth. In nearly all the fields, science became more esoteric, requiring an understanding of data and methodology that put it beyond the reach of non-specialists. Yet whereas scientific work moved behind the veil, its effects were front and center. From household conveniences to the awe inspiring developments of modern warfare, science and technology touched nearly every aspect of life. As a result, science became the dominant authority for most of the modern world. How Christians viewed and interacted with it thus became one of the major theological questions of the century. Second, as Molly Worthen has so eloquently described, the development of neo-evangelicalism, with its desire to engage mainstream scholarship and willingness to redefine some of its theological commitments, provided fertile ground for those who wanted a more positive relationship with science. Debates about the validity of evolutionary theory went hand in hand with debates about the Bible’s inerrancy or questions about its historicity. Third were similar theological developments in the UK, where evangelical groups such as Inter-Varsity Fellowship (today UCCF) attempted to reach a new generation of university students by restoring intellectual respectability among both church leaders and the laity. The RSCF, in fact, was founded as part of IVF and remained so until 1996. These efforts were more systematic and encountered less cultural resistance than those in the US, but there were still those in the UK who rejected anything that resembled accommodation to the secular world. Significantly, ASA and RSCF leaders denied the accusation that they were unjustly accommodating their faith. Rather, they were convinced that antievolutionism was not just bad science but also bad theology, and they were helped on this front by new trends within evangelicalism on both sides of the Atlantic. PLS: Your book also helps to historicize the development of what became known as creationist science. Can you explain how its growth tracked alongside of social, political, and cultural changes from the 1960s onward, and how this fits into your rendering of a “new creationism”? What do you mean by a “new creationism”? In this context, what made creationism enduringly attractive to some, while others roundly dismissed it as religious propaganda? With these trends in mind, how does your scholarship on science and religion help us to make sense of the cultural meaning of the recent Bill Nye/Ken Ham “debate”? CR: That’s a big question. Let me offer two responses, and you can prod me about the bits I ignore. First, by “new creationism” I mean an understanding of creation that was opposed to “modern creationism”—the antievolutionary views that dominated American evangelicalism from the 1960s onward. Several historians, most notably Ron Numbers, have shown how individuals such as Henry Morris and John Whitcomb convinced a generation that true Christian faith required antievolutionism. Prior to this period “creationism” could refer to a variety of theological ideas, but beginning in the 1960s the term became almost exclusively associated with antievolutionary thought. Being a creationist meant that you rejected evolution. This idea won widespread acceptance, especially in the US, in part because it confirmed what many Americans within and outside evangelicalism assumed. But it was never universally accepted, and ASA and RSCF leaders dedicated considerable energy to refuting it. They saw themselves as creationists because they believed that God created the world and they affirmed the truth of passages such as Genesis 1-3. But they were also scientists who affirmed the scientific truth of evolution. Creationism, they argued, thus did not equal antievolutionism. The new creationism I’m talking about, then, is evolutionary creationism, the acceptance of both the biblical account of creation and the scientific understanding of evolution. I hope readers will keep three points in mind as they evaluate these groups. First, there’s little that’s actually new about this view, or at least about the motivation for it. What made it seem new was that most mid-century evangelicals had forgotten that before the infamous Scopes trial of 1925, some of the most respected evangelical theologians attempted to reconcile creation and evolution. Second, it’s important to recognize that the ASA and RSCF were talking to both the churches and scientific communities. The RSCF, in fact, was originally aimed primarily at the scientific community. They assumed that science was a valid, meaningful enterprise. Their message was that it shouldn’t be an obstacle to faith. Third, the membership of neither group was fully accepting of evolution. The leaders were often in agreement, especially the RSCF, but dissenters existed in both organizations. In fact, some of the most insightful debates occurred among the members themselves. Second, the attention given to the Bill Nye-Ken Ham debate demonstrates and reinforces the perception that Christianity and science are opponents. It also reveals the limited success the ASA and RSCF (today called Christians in Science) have had in spreading their message. More than making sense of the debate, my work demonstrates that Nye and Ham represent a false dichotomy. Their positions aren’t the only ones available. I was encouraged to read some of the social media commentary on the event and see some frustration over the lack of a third voice. The Nye-Ham debate also perpetuates a conversation (if you can call it that) that misses the more important questions. That one can believe in both creation and evolution is a simple historical fact demonstrated by the many Christians who have done so. How Christians have reconciled creation and evolution is the more interesting question. How they read Scripture, viewed science, understood the relationship between divine activity and natural laws—these are the more interesting kinds of questions, ones that the public debates often miss, and ones into which I hope my book offers some insight. PLS: What projects are you working on now? More than making sense of the debate, my work demonstrates that Nye and Ham represent a false dichotomy. Their positions aren’t the only ones available. I was encouraged to read some of the social media commentary on the event and see some frustration over the lack of a third voice. Q--You think those were not literal days? A--I do not think they were twenty-four-hour days. Q--What do you think about it? A--That is my opinion--I do not know that my opinion is better on that subject than those who think it does. Q--You do not think that ? A--No. But I think it would be just as easy for the kind of God we believe in to make the earth in six days as in six years or in 6,000,000 years or in 600,000,000 years. I do not think it important whether we believe one or the other. Darrow and Bryan, of course. That stupid movie is all America knows of any of this.